The U.S. tax code is a burdensome mess that severely stifles economic growth. The U.S. has the highest corporate tax rate in the developed world, high taxes on investment, and heavy restrictions on the flow of capital, all of which damage investment in the United States, and jobs and wages with it. It’s clear to just about everyone that the tax code needs reform. But it’s important that tax reform remembers small businesses, too. We released a report earlier this month detailing the tax code that entrepreneurs face. Many small businesses file taxes as pass-throughs, which mean the business owners pay the business tax on their personal income tax form. About 95 percent of businesses are pass-throughs accounting for 54 percent of business income. Much of this income is earned by high-earners. In fact, almost all job creators (small businesses with more employees than just the owner) earn over $100,000. 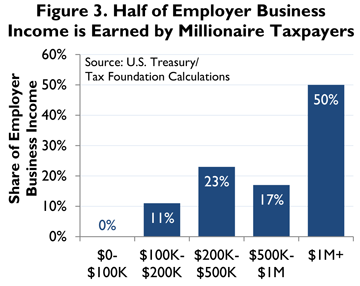 Even more so, 67 percent of employer business income is earned by business owners with income of over $500,000. This means that for over 67 percent of the business income created in the United States, for every dollar these businesses earn, they pay a dollar in taxes. That is a dollar that those businesses are unable to reinvest in new equipment, higher wages, and new jobs. Tax reform that cuts the corporate rate to 25 percent or below would be great for the economy, but with over half of business income taxed under the individual code, tax reform that cuts the rate for small businesses to 25 percent or below, too, would be even better for the economy. For the sake of economic growth, tax reform should remember small businesses. For a list of top marginal rates for every state, click here.